While grooming your dog can polish his or her appearance and eliminate the specter of unpleasant dog smells, it’s not just a superficial task. The physical maintenance of your dog’s nails, ears, and coat plays an important role in keeping your pet happy and healthy. Are you ready to gather together the best grooming tools for dogs? The best grooming tools for dogs are specifically designed for canines. They address the various challenges that you’re likely to encounter while working to keep your pet neat and tidy. While some grooming tasks are best left to the professionals, every dog owner should have a selection of basic tools on hand so that they can care for their pet’s nails, ears, and coat. While nail trims can be stressful, they are the lesser evil. Unattended nails that grow too long can lead to scratches and damaged floors, make moving around painful for your pet, and set the stage for ripped or torn nails that require veterinary attention. What do you need to trim your pet’s nails? For starters, you’ll require patience and knowledge of the proper technique. Then, you’ll need the proper tools. To cut the nails, you can opt for guillotine trimmers, scissor-like trimmers, or nail grinders (small versions of a Dremel tool). A little experimenting may be required to find the trimmer that works best for you and your pal. It’s also wise to have filing tools in your nail-trimming kit that can grind away sharp, ragged edges and styptic powder that stops the bleeding if a nail is cut too short. Dirty ears look and smell bad, and they can make your pet uncomfortable, so ear care should be a regular part of your grooming regimen. To clean your canine companion’s ears, dampen a cotton ball or pad with hydrogen peroxide or an ear cleaning solution formulated specifically for this purpose. Then, gently wipe away the grime. You could also use ear cleaning wipes, which are conveniently pre-moistened and ready to use. Don’t be too aggressive and never insert anything into your pet’s ear canal. Bristle Brushes: A good choice for most hair types, bristle brushes range from soft to firm, so you can select the option that you and your pet prefer. Slicker Brushes: Is your dog prone to tangles? A slicker brush is a great tool for removing tangles and mild matting from the coats of dogs with medium or long hair. Wire Pin Brushes: These brushes are best for pooches with curly or woolen coats and medium or long hair. Flea Combs: Flea combs can be used on dogs with any type of coat to detect and remove fleas. Shedding Tools: As the name implies, these implements excel at removing excess hair to reduce shedding. Rakes and Matbreakers: While a rake or matbreaker probably wouldn’t be your go-to tool for brushing your dog, these grooming aids are helpful if your pet has severe tangles or matting. To keep your dog’s coat and skin healthy, you can’t just grab any old thing off the shelf and hope for the best. It’s essential that you choose the right shampoo and conditioner. For starters, this means opting for products that are formulated for dogs. Why won’t human shampoo do? Using a shampoo intended for people can mess with the pH of your pet’s skin, disrupting its protective acid mantle and creating an environment where bacteria and other unpleasantries can thrive. Since you want your pet to be comfortable and to keep bath time drama at a minimum, it’s also best to choose products that are tear-free and gentle to avoid stinging eyes or irritated skin. Do you use topical flea and tick treatments? If so, you’ll want shampoos that won’t interfere with them. This may seem like a tall order, but it’s actually fairly simple. You just have to choose dog shampoos and conditioners offered by trusted brands that are made with quality ingredients. When you’re searching for the best grooming tools for dogs, count on Petsway. Our team of pet experts would be delighted to help you find the right products for you pooch. Visit us today to explore our selection of grooming gear. 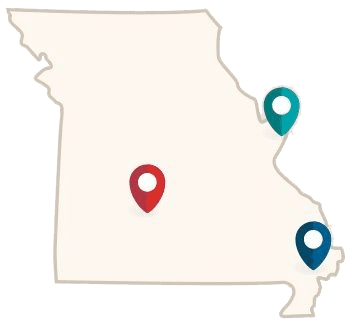 With locations in Springfield, Nixa, St. Louis, St. Peters, and Poplar Bluff, Missouri, we’re bound to have a store near you.